At any rate, when I think of gay couples, my mind goes to a couple of examples; Renee Montoya and Kate Kane for one, and another is Apollo and Midnighter. I was initially pretty happy to learn that the talented Brian Stelfreeze (of Wednesday Comics' Catwoman and the Demon) would be drawing this issue, #6, of The Authority: The Lost Year. Unfortunately, it turned out that he was only doing layouts (or less. The credits list him as "storyteller," whatever that means.) The finishing artist is...not nearly as good. So as of the end of last issue, the Carrier's out of juice, stranding the Authority on an Earth that's latched onto a slumbering Lovecraft-ian entity. What next? 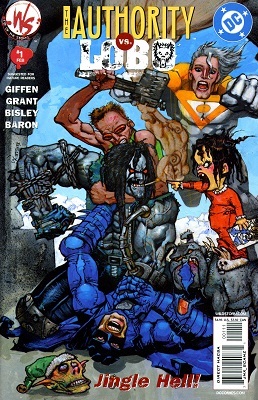 When last issue left off, the Authority were trapped in "our" world. American soldiers had just shot down Apollo in Afghanistan because their radar or whatever picked him up as a missile, and Midnighter had just arrived on the scene to effect rescue.